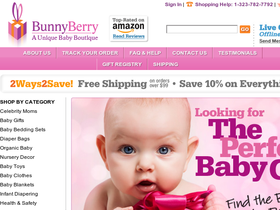 BunnyBerry, at BunnyBuryBaby.com, is a unique baby boutique offering thousands of options for your bundle of joy. Shop all of the top baby brands including JJ Cole, Speesees, Swaddle Designs, Kushies, and Fleurville at BunnyBerry and find everything from apparel to furniture, bedding to books, nursing to diapering supplies. Being located in Los Angeles allows BunnyBerry to be at the center of all the latest baby trends, helping them to only offer products with that “wow factor.” With a low price guarantee, you can rest assured you are getting the best price for your baby gear. Save even more with the most up to date BunnyBerry discounts, BunnyBerry coupon codes, and BunnyBerry promos from RetailSteal.com. Get free shipping on orders over $75 within the contiguous United States. For refund, return item within 30 days of purchase. See site for full details as exclusions may apply. Use this coupon code online at BunnyBerry and enjoy a $15 discount on your order of $150+. Use this code at BunnyBuryBaby.com to get 10% off your entire order. Click link to save. Enjoy $10 savings at BunnyBerry when you use this coupon code with purchases $100+. Click to shop and save. Save 10% off your purchase of baby albums or brag books with this coupon code from BunnyBerry.com. Check out the Daily Deals at BunnyBerry and find savings of up to 50%. Click link to shop and save. Sign-up for the newsletter at Bunnyberry.com and save 15% off your next order. Enjoy 15% savings on Fuzzi Bunz cloth diapers when using this coupon code at Bunny Berry. Use this promo code at BunnyBerry and get free shipping on all orders pf $75 or more.